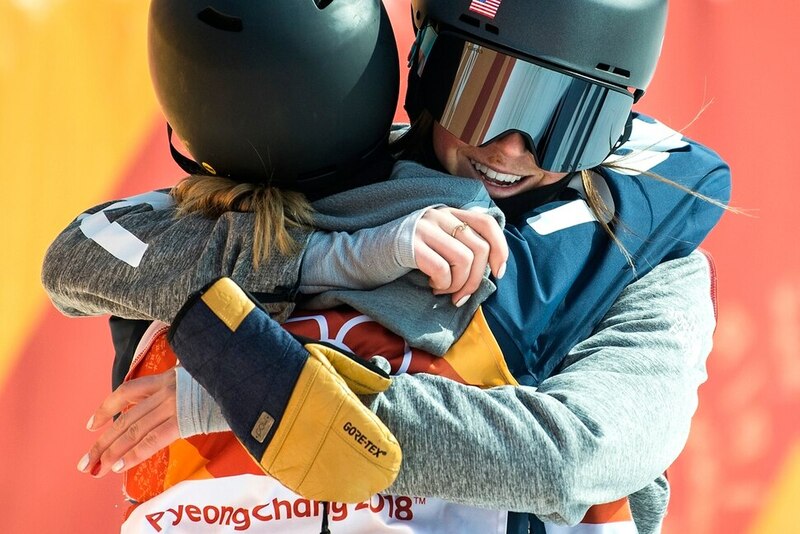 (Chris Detrick | The Salt Lake Tribune) Brita Sigourney of the United States hugs Annalisa Drew of the United States after hearing her score after the Ladies' Ski Halfpipe Final Run at Phoenix Park during the Pyeongchang 2018 Winter Olympics Tuesday, Feb. 20, 2018. Sigourney finished in 3rd place with a score of 89.80. 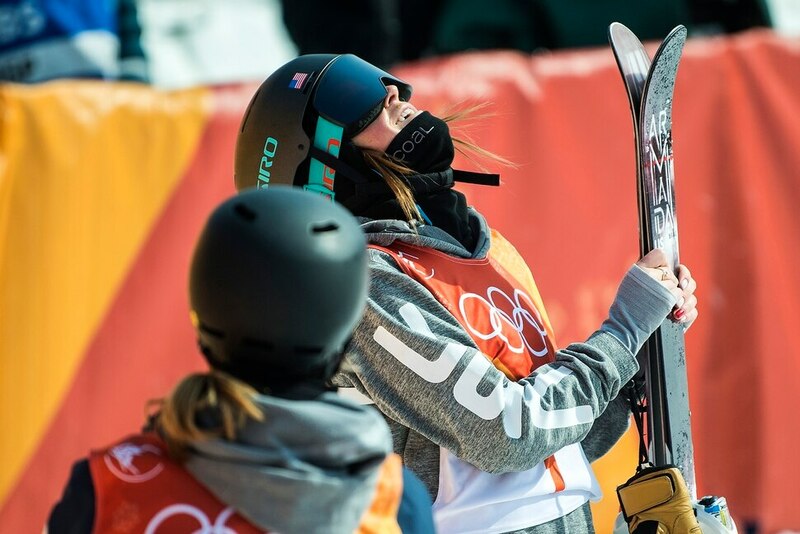 (Chris Detrick | The Salt Lake Tribune) Brita Sigourney of the United States reacts after hearing her score after the Ladies' Ski Halfpipe Final Run at Phoenix Park during the Pyeongchang 2018 Winter Olympics Tuesday, Feb. 20, 2018. Sigourney finished in 3rd place with a score of 89.80. (Chris Detrick | The Salt Lake Tribune) Brita Sigourney of the United States competes in the Ladies' Ski Halfpipe Final Run at Phoenix Park during the Pyeongchang 2018 Winter Olympics Tuesday, Feb. 20, 2018. Sigourney finished in 3rd place with a score of 89.80. (Chris Detrick | The Salt Lake Tribune) Maddie Bowman of the United States competes on her final run in the Ladies' Ski Halfpipe Final Run at Phoenix Park during the Pyeongchang 2018 Winter Olympics Tuesday, Feb. 20, 2018. Bowman, the gold medal winner in the 2014 Sochi Olympics, finished in 11th place with a score of 25.80. (Chris Detrick | The Salt Lake Tribune) Brita Sigourney of the United States competes in the Ladies' Ski Halfpipe Final Run at Phoenix Park during the Pyeongchang 2018 Winter Olympics Tuesday, Feb. 20, 2018. Sigourney finished in 3rd place with a score of 89.80. (Chris Detrick | The Salt Lake Tribune) Brita Sigourney of the United States celebrates after the Ladies' Ski Halfpipe Final Run at Phoenix Park during the Pyeongchang 2018 Winter Olympics Tuesday, Feb. 20, 2018. Sigourney finished in 3rd place with a score of 89.80. (Chris Detrick | The Salt Lake Tribune) Brita Sigourney of the United States celebrates after the Ladies' Ski Halfpipe Final Run at Phoenix Park during the Pyeongchang 2018 Winter Olympics Tuesday, Feb. 20, 2018. Sigourney finished in 3rd place with a score of 89.80. (Chris Detrick | The Salt Lake Tribune) Brita Sigourney of the United States celebrates after the Ladies' Ski Halfpipe Final Run at Phoenix Park during the Pyeongchang 2018 Winter Olympics Tuesday, Feb. 20, 2018. Sigourney finished in 3rd place with a score of 89.80. (Chris Detrick | The Salt Lake Tribune) Maddie Bowman of the United States crashes on her final run in the Ladies' Ski Halfpipe Final Run at Phoenix Park during the Pyeongchang 2018 Winter Olympics Tuesday, Feb. 20, 2018. Bowman, the gold medal winner in the 2014 Sochi Olympics, finished in 11th place with a score of 25.80. (Chris Detrick | The Salt Lake Tribune) Brita Sigourney of the United States celebrates after the Ladies' Ski Halfpipe Final Run at Phoenix Park during the Pyeongchang 2018 Winter Olympics Tuesday, Feb. 20, 2018. Sigourney finished in 3rd place with a score of 89.80. (Chris Detrick | The Salt Lake Tribune) Annalisa Drew of the United States competes in the Ladies' Ski Halfpipe Final Run at Phoenix Park during the Pyeongchang 2018 Winter Olympics Tuesday, Feb. 20, 2018. Drew finished in 4th place with a score of 86.80 (Chris Detrick | The Salt Lake Tribune) Brita Sigourney of the United States and Annalisa Drew of the United States hug after the Ladies' Ski Halfpipe Final Run at Phoenix Park during the Pyeongchang 2018 Winter Olympics Tuesday, Feb. 20, 2018. (Chris Detrick | The Salt Lake Tribune) Brita Sigourney of the United States competes in the Ladies' Ski Halfpipe Final Run at Phoenix Park during the Pyeongchang 2018 Winter Olympics Tuesday, Feb. 20, 2018. Sigourney finished in 3rd place with a score of 89.80. (Chris Detrick | The Salt Lake Tribune) Brita Sigourney of the United States celebrates after the Ladies' Ski Halfpipe Final Run at Phoenix Park during the Pyeongchang 2018 Winter Olympics Tuesday, Feb. 20, 2018. Sigourney finished in 3rd place with a score of 89.80. (Chris Detrick | The Salt Lake Tribune) Brita Sigourney of the United States celebrates after the Ladies' Ski Halfpipe Final Run at Phoenix Park during the Pyeongchang 2018 Winter Olympics Tuesday, Feb. 20, 2018. Sigourney finished in 3rd place with a score of 89.80. (Chris Detrick | The Salt Lake Tribune) Brita Sigourney of the United States hugs Maddie Bowman of the United States after the Ladies' Ski Halfpipe Final Run at Phoenix Park during the Pyeongchang 2018 Winter Olympics Tuesday, Feb. 20, 2018. Sigourney finished in 3rd place with a score of 89.80. Bowman, the gold medal winner in the 2014 Sochi Olympics, finished in 11th place with a score of 25.80. (Chris Detrick | The Salt Lake Tribune) Maddie Bowman of the United States after crashing on her final run in the Ladies' Ski Halfpipe Final Run at Phoenix Park during the Pyeongchang 2018 Winter Olympics Tuesday, Feb. 20, 2018. Bowman, the gold medal winner in the 2014 Sochi Olympics, finished in 11th place with a score of 25.80. (Chris Detrick | The Salt Lake Tribune) Maddie Bowman of the United States after crashing on her final run in the Ladies' Ski Halfpipe Final Run at Phoenix Park during the Pyeongchang 2018 Winter Olympics Tuesday, Feb. 20, 2018. Bowman, the gold medal winner in the 2014 Sochi Olympics, finished in 11th place with a score of 25.80. 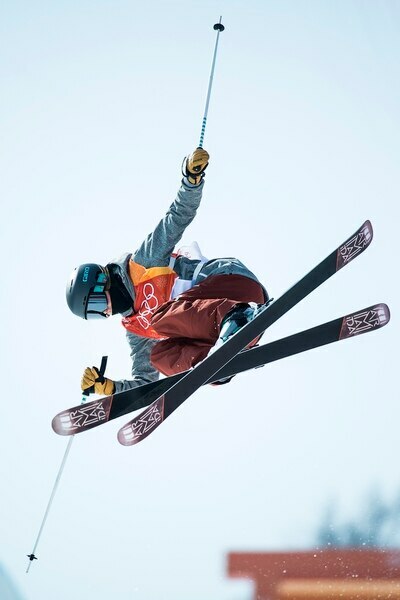 (Chris Detrick | The Salt Lake Tribune) Japan's Raibu Katayama competes in the men's halfpipe finals at Phoenix Snow Park during the Pyeongchang 2018 Winter Olympics Wednesday, Feb. 14, 2018. (Chris Detrick | The Salt Lake Tribune) Annalisa Drew of the United States competes in the Ladies' Ski Halfpipe Final Run at Phoenix Park during the Pyeongchang 2018 Winter Olympics Tuesday, Feb. 20, 2018. Drew finished in 4th place with a score of 86.80 (Chris Detrick | The Salt Lake Tribune) Maddie Bowman of the United States after crashing on her final run in the Ladies' Ski Halfpipe Final Run at Phoenix Park during the Pyeongchang 2018 Winter Olympics Tuesday, Feb. 20, 2018. Bowman, the gold medal winner in the 2014 Sochi Olympics, finished in 11th place with a score of 25.80. (Chris Detrick | The Salt Lake Tribune) Maddie Bowman of the United States competes in the Ladies' Ski Halfpipe Final Run at Phoenix Park during the Pyeongchang 2018 Winter Olympics Tuesday, Feb. 20, 2018. Bowman, the gold medal winner in the 2014 Sochi Olympics, finished in 11th place with a score of 25.80. (Chris Detrick | The Salt Lake Tribune) Maddie Bowman of the United States reacts after crashing on her final run in the Ladies' Ski Halfpipe Final Run at Phoenix Park during the Pyeongchang 2018 Winter Olympics Tuesday, Feb. 20, 2018. Bowman, the gold medal winner in the 2014 Sochi Olympics, finished in 11th place with a score of 25.80. (Chris Detrick | The Salt Lake Tribune) Maddie Bowman of the United States reacts after crashing on her final run in the Ladies' Ski Halfpipe Final Run at Phoenix Park during the Pyeongchang 2018 Winter Olympics Tuesday, Feb. 20, 2018. Bowman, the gold medal winner in the 2014 Sochi Olympics, finished in 11th place with a score of 25.80. (Chris Detrick | The Salt Lake Tribune) Marie Martinod of France Cassie Sharpe of Canada and Brita Sigourney of the United States celebrate after the Ladies' Ski Halfpipe Final Run at Phoenix Park during the Pyeongchang 2018 Winter Olympics Tuesday, Feb. 20, 2018. (Chris Detrick | The Salt Lake Tribune) Maddie Bowman of the United States competes in the Ladies' Ski Halfpipe Final Run at Phoenix Park during the Pyeongchang 2018 Winter Olympics Tuesday, Feb. 20, 2018. Bowman, the gold medal winner in the 2014 Sochi Olympics, finished in 11th place with a score of 25.80. (Chris Detrick | The Salt Lake Tribune) Cassie Sharpe of Canada competes in the Ladies' Ski Halfpipe Final Run at Phoenix Park during the Pyeongchang 2018 Winter Olympics Tuesday, Feb. 20, 2018. (Chris Detrick | The Salt Lake Tribune) Brita Sigourney of the United States competes in the Ladies' Ski Halfpipe Final Run at Phoenix Park during the Pyeongchang 2018 Winter Olympics Tuesday, Feb. 20, 2018. Sigourney finished in 3rd place with a score of 89.80. (Chris Detrick | The Salt Lake Tribune) Brita Sigourney of the United States competes in the Ladies' Ski Halfpipe Final Run at Phoenix Park during the Pyeongchang 2018 Winter Olympics Tuesday, Feb. 20, 2018. Sigourney finished in 3rd place with a score of 89.80. (Chris Detrick | The Salt Lake Tribune) Annalisa Drew of the United States competes in the Ladies' Ski Halfpipe Final Run at Phoenix Park during the Pyeongchang 2018 Winter Olympics Tuesday, Feb. 20, 2018. (Chris Detrick | The Salt Lake Tribune) Annalisa Drew of the United States competes in the Ladies' Ski Halfpipe Final Run at Phoenix Park during the Pyeongchang 2018 Winter Olympics Tuesday, Feb. 20, 2018. (Chris Detrick | The Salt Lake Tribune) Valeriya Demidova of Olympic Athlete from Russia competes in the Ladies' Ski Halfpipe Final Run at Phoenix Park during the Pyeongchang 2018 Winter Olympics Tuesday, Feb. 20, 2018. (Chris Detrick | The Salt Lake Tribune) Maddie Bowman of the United States competes in the Ladies' Ski Halfpipe Final Run at Phoenix Park during the Pyeongchang 2018 Winter Olympics Tuesday, Feb. 20, 2018. (Chris Detrick | The Salt Lake Tribune) Marie Martinod of France kisses her daughter Meli Rose, 8, after the Ladies' Ski Halfpipe Final Run at Phoenix Park during the Pyeongchang 2018 Winter Olympics Tuesday, Feb. 20, 2018. (Chris Detrick | The Salt Lake Tribune) Marie Martinod of France celebrates with her daughter Meli Rose, 8, after the Ladies' Ski Halfpipe Final Run at Phoenix Park during the Pyeongchang 2018 Winter Olympics Tuesday, Feb. 20, 2018. (Chris Detrick | The Salt Lake Tribune) Sabrina Cakmakli of Germany crashes while competing in the Ladies' Ski Halfpipe Final Run at Phoenix Park during the Pyeongchang 2018 Winter Olympics Tuesday, Feb. 20, 2018. Bongpyeong, South Korea • A single thump from the loudspeaker sounded like a racing heartbeat, as Brita Sigourney waited. “Come on,” she said impatiently. And when the halfpipe skier’s score finally appeared on the board, Sigourney embraced her American teammate, Annalisa Drew. Four years ago in Sochi, Sigourney was on the other end of a hug like that, walking away from her first Olympics without a medal. This time, bronze felt like gold. Sigourney was nervous and nauseous and sitting in fourth place as she pointed her skis downward for her third and final run on Tuesday morning. Once she got going, Sigourney was in her element. She went big, rode clean and stomped all five of her hits for a score of 91.60, putting her behind only gold medalist Cassie Sharpe, of Canada, and silver medalist Marie Martinod, of France. Sigourney’s final run also bumped Drew down to fourth place. “I knew she had it as soon as she dropped in,” Drew said. “I know Brita,” she said. The two Americans waited together for the Sigourney’s score to come in, then hugged when they finally did. “I’m super stoked for Brita,” Drew said. In Sochi, it was Sigourney telling a teammate to enjoy her moment as Maddie Bowman skied her way to a gold medal. But after three knee surgeries, two shoulder surgeries, one thumb surgery and one ankle surgery in her career followed by four years to reflect on her first Olympic experience, Sigourney came to South Korea wanting hardware. On Tuesday, Bowman, who lives in Utah and attends Westminster College, fell on the final hit of each of her three runs as she tried to put together back-to-back 900-degree spins.